I’ve been a big fan of Windows 10 since it first rolled out to consumers. While Windows 7 had its advantages, I felt Windows 10 was the better operating system since it ran better on the older hardware that I had. That was until yesterday when an older laptop of mine told me that my installation of Windows 10 could not be activated. 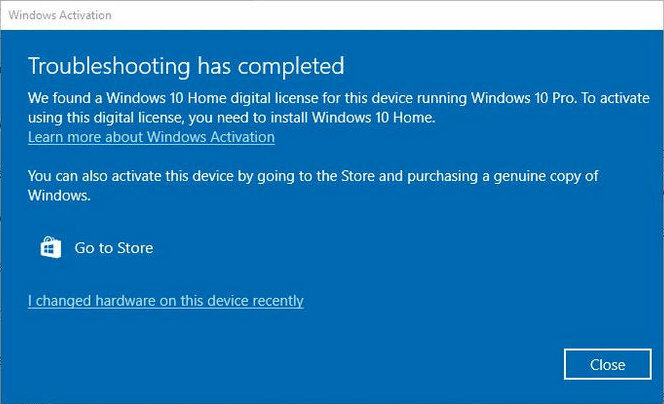 When I ran the activation troubleshooter I was told that I had Windows 10 Pro was installed on my machine but my license was for Windows 10 Home. I figured this had something to do with some new hardware I installed on my older laptop so I did a fresh install of Windows 10 Home on my laptop. As it turns out you don’t have to do that. If in the past day or so you’ve got the message that your Windows 10 Pro installation needs to be activated you can ignore that message for now. Your Windows license is actually fine, it’s Microsoft that’s having the problem. Many tech outlets are reporting that Microsoft is having an issue with their activation servers which is causing this bug for some Windows 10 Pro users. Reportedly, the bug mostly affects users who had upgraded from Windows 7 or 8 while Microsoft was offering the free upgrade to Windows 10. Normally, when Windows says it needs to be activated the OS will give you 30 days to obtain a valid license. Hopefully, Microsoft won’t take this long in fixing this latest Windows 10 bug. It is a possibility since Microsoft still hasn’t fixed their previous bug which saw files being deleted with the October Update of Windows 10. That update has been pushed back because of that bug and has not yet been fixed. Most consumers probably won’t even see this latest bug since Windows Pro, as the name implies, is designed more for professional users, however. Pro users really do rely on those extra security and remote desktop features. So for now, if you received the activation warning, hold tight and hopefully, Microsoft will have the problem fixed shortly. Although, you may not want to hold your breath in the meantime.